Each morning and evening, just like clockwork, out come the twins. Now I'm really not sure if they are twins or sweethearts, but inevitably, they are together. Where there's one, the other is not far behind. Hence, they have been dubbed the twins. Spotting them I grab "little zoomer" and tiptoe out the front door trying to be as quiet as a mouse. Although they've eaten my Black-Eyed Susans down to the ground and totally trimmed all my mounds of Moonbeam that had gone to seed, they are just too cute to chase off. Now we've become so accustomed to them showing up that if they don't I wonder if something happened to them. Of course, since the Eagles won't be back until November or December, the bunnies have to watch out for the other raptors that hang around our neck of the woods. Oh my, they are adorable! Cute images and mosaic! Happy Monday! Oh I bet they are twins or sibs...so cute! They are cute. We used to have one living under our shed but I haven't spotted it in quite some time. They are cute. If they're sweethearts you may have many more of them soon! They're definitely cute - because they're in your yard. 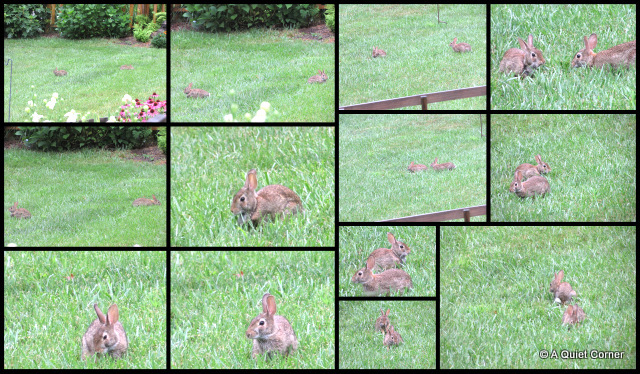 :-) With no predators our bunny population is exploding. Oh, what a sweet bunny set of photos. Too cute! How lucky you are to have rabbits visit. They killed off all the animals around Perth. We used to enjoy seeing them as we drove past a local university but they are all dead and gone now. I suppose they were a nuisance in the gardens but there are worse things around than rabbits. Thank you for sharing the twins with us.